NASA had a big week for Hall of Fame inductions at the Space Foundation's 35th Space Symposium. 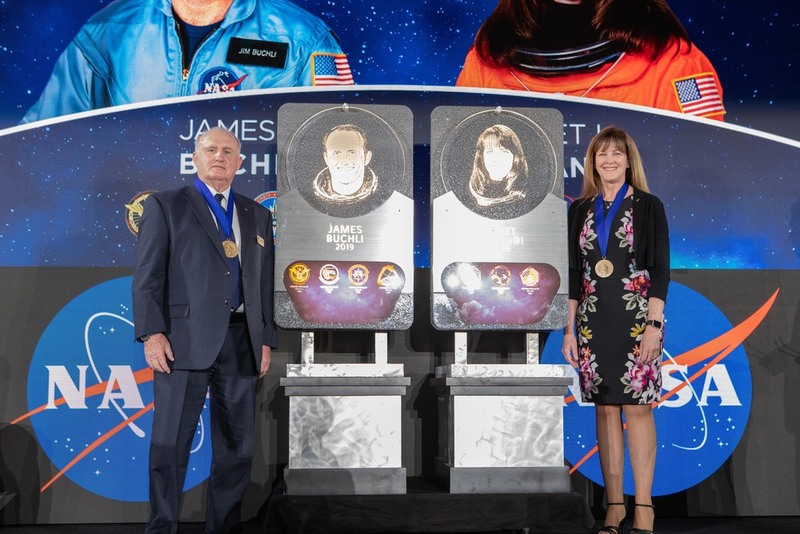 Two veteran NASA astronauts were inducted into the U.S. Astronaut Hall of Fame and Johnson Space Center was inducted along with JSC Crew Health and Medical Lead Michael Rapley and fromer NASA Chief of Medical Operations Roger Billica. Ph.D. into the Space Technology Hall of Fame. Kavandi was a member of NASA’s 15th class of astronaut candidates, selected in 1994. She is a veteran of three space shuttle missions, serving as a mission specialist on STS-91 in 1998, STS-99 in 2000 and STS-104 in 2001. She has logged more than 33 days in space, traveling more than 13.1 million miles in 535 Earth orbits. Buchli was part of NASA’s 1978 astronaut candidate class. He was a member of the space shuttle support crew for STS-1 and STS-2, both in 1981, and served as on-orbit capsule communicator for STS-2. A veteran of four spaceflights, Buchli has orbited Earth 319 times, traveling 7.74 million miles over a span of more than 20 days. He served as a mission specialist on STS-51C in 1985, STS-61A in 1985, STS-29 in 1989 and STS-48 in 1991. From March 1989 until May 1992, he also served as deputy chief of the Astronaut Office. JSC Center Director Mark Geyer celebrating the induction with the iRED team. For this work, JSC Crew Health and Medical Lead Michael Rapley and fromer NASA Chief of Medical Operations Roger Billica. Ph.D. were inducted into the Space Technology Hall of Fame along with Johnson Space Center as an organization.